A judge has granted a media petition to obtain the names of jurors who failed to reach a unanimous verdict that led to a mistrial in Bill Cosby's sexual assault case after. The 79-year-old actor faced up to a decade in prison if convicted. More than 50 women accused Cosby of sexual assaults dating back to the 1960s. An American journalist took to Twitter tonight to reveal that the jury members in question could be named. Bobby Allyn, a journalist in Philadelphia, said: "#CosbyTrial judge grants media group petition to obtain names of jurors who could not reach a unanimous verdict." But Andrea Constand, 44, was at the centre of this case, as the 13-year-old incident was the only one recent enough to support criminal charges. Cosby, 79, best known for playing a revered father figure in the 1980s television hit family comedy series The Cosby Show, denied all the allegations at court in Norristown, a suburb of Philadelphia. He declined to testify but extracts from his previous deposition were read aloud for about 30 minutes in court. 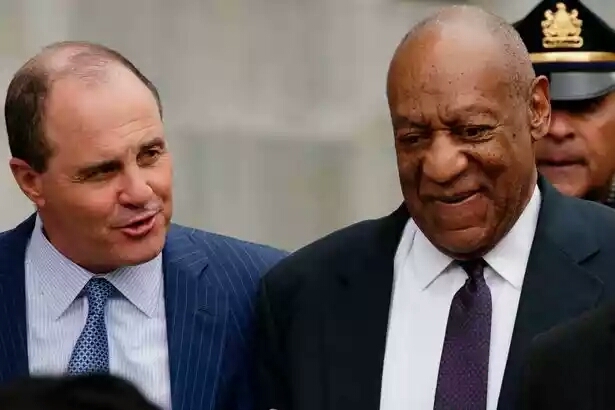 His defence lawyers presented a single witness - Detective Richard Schaffer who appeared for just six minutes on Monday and told the jury that Ms Constand had visited Mr Cosby at an out-of-state casino. After a mistrial was ruled, Radar Online reported that attorneys have prepared paperwork and will appeal for Cosby to stand trial again for sexual assault. On Tuesday a packed court heard that Andrea Constand could feel Bill Cosby's hands on her body, but the drugs in her system would not let her stop him. "In my head, I was trying to get my hands to move, my legs to move, but I was frozen," she testified. "I wanted it to stop." Cosby, sitting across the courtroom, shook his head as Constand described the alleged encounter after she accepted three blue pills that he promised would help her "relax". Constand said she first met Cosby in late 2002, when she was the newly hired director of basketball operations for Temple University's women's basketball program and he was a university trustee and the Philadelphia school's most famous alumnus. After a series of phone calls, Constand, who was then in her 30s, said married Cosby began inviting her to dinner at his house and other events. "He was a Temple friend, somebody I trusted, a mentor and somewhat of an older figure to me," Constand testified. On at least one occasion, Constand said she rebuffed his advances, telling him she had no interest. In January 2004, Constand told the court that Cosby invited her to his house again to discuss her career options. That night, he offered her the three blue pills, saying they were her "friends." Constand said she told Cosby she trusted him and swallowed the pills. After the incident, Constand acknowledged under questioning from both sides that she maintained contact with Cosby but said she felt obligated to do so because of her job. The defence suggested that her repeated calls to him showed the encounter was consensual. 0 Comment to "Bill Cosby sexual assault trial: Judge grants media petition to name jurors who failed to reach unanimous verdict that led to mistrial"